In stock 29 pcs. Also available in our walk-in store. The Germans sure love their Y-straps, almost as much as their jackboots, and continued to use them until the 80's and 90's. 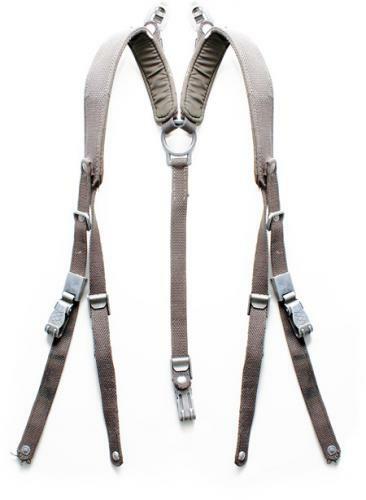 The West-German army had two webbing suspenders for light or heavy use. These are the "heavier" model with pack straps and all, these are meant to haul things and not just keep your trousers up. Visually these resemble the war-time model, most obviously these are thicker and partially padded. There are five straps, of which the two front ones are attached to belt loops or magazine pouches, the next ones go to the back to the bottom of your day pack, and the single rear one goes on the belt. The top has additional clips for the day pack (sold separately, if available). To put things in short and nice order, the principle is the same as used before and during the war, just improved here and there. Nice n' heavy. Bought mine to hold a belt up with and they do that well. I can see these being really useful for someone doing construction who needs more support on their tool-belt. Ordered these for post-apocalyptic costume project with bunch of other stuff. Smell is deadly, visibly they are fine but apparently infested with mold. Some other items in the same shipment had the same problem and the stench had stuck to other, new items too. Have to return the moldy ones, me and family members got actual symptoms like running nose, red eyes and itching. Thing's dirt cheap ! Very durable and tough, almost comfortable. On the other hand, the hardware's very heavy and difficult to adjust. With some strap cutting and tweaking, they can become shoulder straps for an old external frame knapsack.